By Joseph Mohr & Franz Gruber. Luke 2:1-52. 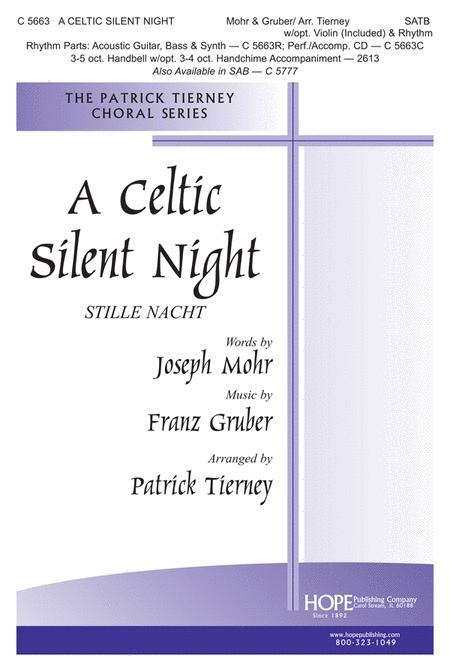 An essential component of every Christmas service or concert is the inclusion of "Silent Night," and this is sure to become a choral favorite with its authentic Celtic rhythms and unique harmonies. The choral writing is straightforward and easily learned, and the instrumental parts add breathtaking enjoyment to this refreshing approach to the beloved carol. The violin part is included. This top-seller is now available in SAB with a new 3-5 octave handbell setting that can serve as the accompaniment to the choral settings or stand alone as a piece for handbell choirs. The reproducible violin part is included. The separate Rhythm packet contains parts for Violin, Acoustic Guitar, Bass Guitar & Synth. The Handbell accompaniment, by Joel Raney, can be used with the choral piece or can stand alone. Our mixed ensemble of 5 did this piece with violin on a Sunday morning. It was a beautiful part of our service. were entirely unfounded. 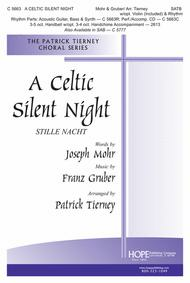 The piece is gentle, emotive in the best sense and with its lilting accompaniment conveys superbly all the charm of the original, but in doing so, gives the various SATB parts their individual opportunity to have the melody for a bit. I would highly recommend this lovely piece. My choir loves it. This is an interesting arrangement of a too-familiar carol. The singers in our choir like it very much especially the way the tune is shared between the four parts. They had no trouble sight-reading it although there were some unexpected harmonic traps. Interesting accompaniment also. Singing the familiar tune and the words we all know and love to different accompaniment tune. Timing is a little different but beautiful. 2011-06-13 00:00:00.0 Our congregation participated! choir only as it has flowing, responsive parts. It has a beautiful violin part and as we don't have a violinist in our church, we had the organist play that part on the organ......worked perfectly. Not just a pick up and know it song.....it does take some practice! 29 of 48 people found this review helpful.